The last article in the series ‘Analyse A Real PPC Campaign’ was on Panasonic which saw me analyse a PPC campaign which made a bid for a highly popular keyword (camera) and send the PPC traffic to a well organised landing page consisting of slideshows and colourful images. In the past, to view campaigns from other companies, I had to type in their own brand name such as for Argos and Sony. For this article, just like I did with Panasonic, I will type in another common and popular keyword phrase. Out of these adverts, I will be looking at WeBuyAnyCar’s campaign. The level of competition for this keyword phrase is large and I can predict at being rather expensive too: a successful conversion for this niche can profit a business thousands of pounds/dollars. 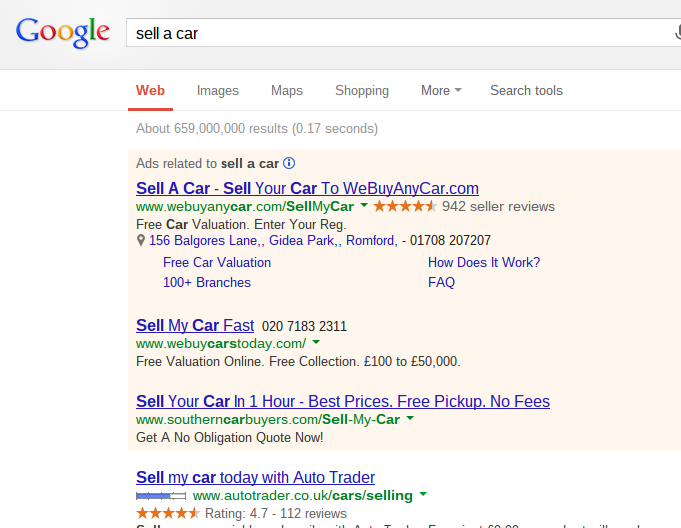 For this reason, to gain top spot for this keyword phrase, WeBuyAnyCar must have had quite a high CPC. WeBuyAnyCar have also been smart in the contents of the text advert itself. Even if they were not the highest bidders and did not have top spot, most web users would be enticed into clicking on their advert anyway because WeBuyAnyCar’s title has the most amount of keywords the same as the search phrase out of all the adverts. This means that more of their advert is bold which will make the advert easier to see to the web user. As well as this, their advert has the most advertising space due to the reviews, Google + add on and more links under the advert. All in all, this will make WeBuyAnyCar gain a very high CTR. 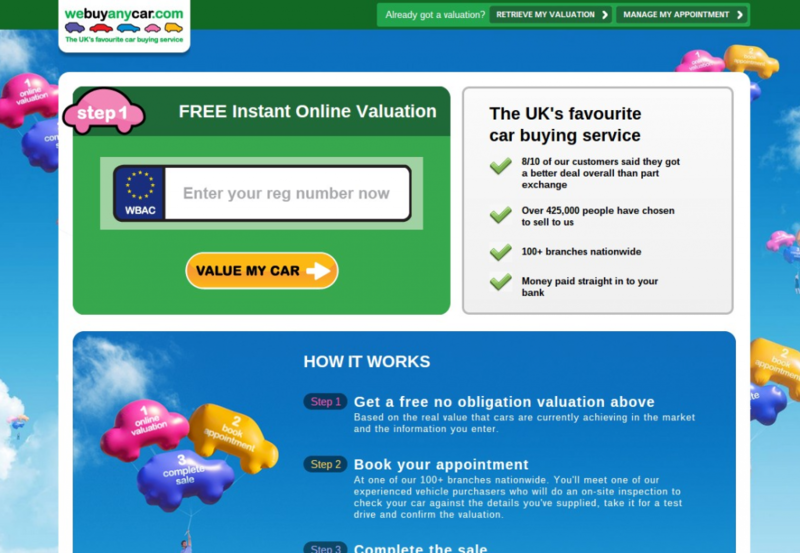 The whole objective of this landing page is to convince the web user to valuing their car through WeBuyAnyCar. This is made clear through the ‘Enter your reg number now’ call to action which is located in a prime location on the landing page. However, there will be some web users that are unsure about using WeBuyAnyCar’s service. For these people, they have listed a bullet point list to the right of why they should use WeBuyAnyCar. 8/10 of our customers said they got a better deal overall than part exchange – WeBuyAnyCar are addressing the price sensitive customers saying that WeBuyAnyCar is the best financial solution to selling a car. Over 425,000 people have chosen to sell to us – With online websites, scams are becoming more and more common. The fact 425,000 people have used them adds some confidence to the web user. 100+ branches nationwide – WeBuyAnyCar are not just a website but have retail shop located across the UK. This adds more confidence to the web user in using them. Money paid straight in to your bank – Above all, WeBuyAnyCar is a quick and simple solution to selling your car. From these four bullet points, web users will be completely sold into using WeBuyAnyCar as it does seem like there isn’t a reason to not use them. For this reason, if you are trying to get your PPC traffic to use a service or buy a product, make sure you sell it to them. People are not just going to buy something or do something for you if they don’t think it is going to benefit them. With PPC, always make you traffic priority. Which PPC Network Should Advertisers Use?